There are two things everyone needs to know about the Belt and Road. First, as officials in Beijing will tell you, this grand project is measured in decades, with its conclusion planned for 2049, the centenary of the founding of the People’s Republic of China. Second, the initiative is both global and revolutionary. Its aim is to create a new order in world politics and the world economy. Could food be the secret to creating international unity? Past equivalents to the Belt and Road would have to be just as shapeless and ambitious. Perhaps concepts such as “the West” come the closest — even in the manner that a metaphor came to acquire epochal significance. If the initiative succeeds, it is very likely that we shall use the name to refer to the new arrangements, much as we use “West” as a shorthand for the existing order. 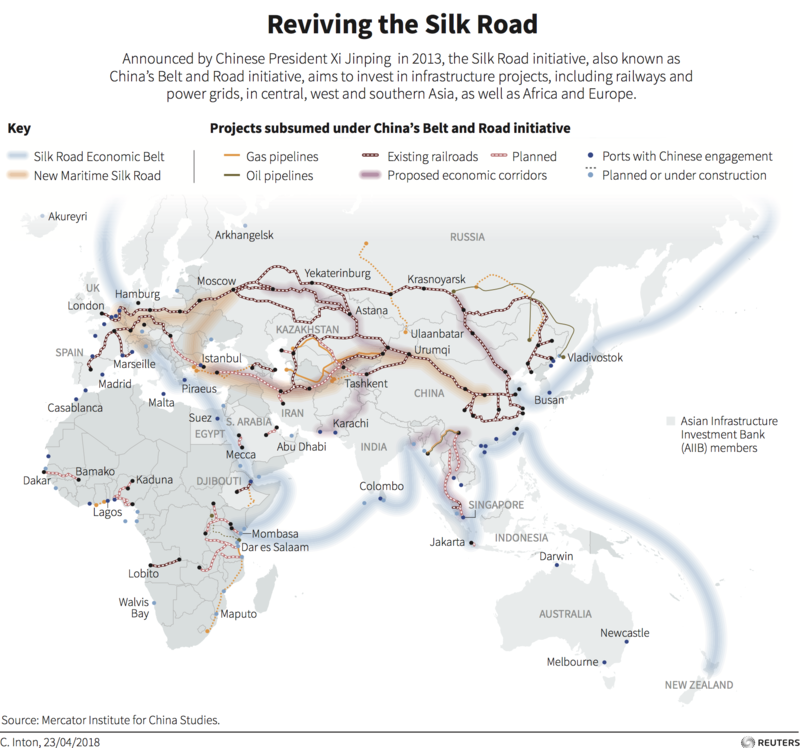 What will the world look like after the Belt and Road? In the first Belt and Road summit in 2017 Xi Jinping hailed it as the “project of the century.” If all goes according to plan, the Belt and Road will change the shape of the world economy and world politics, returning us to a time when China occupied the center of global networks. There will be new infrastructure, of course, and that will be an obvious and easy metric of success. In twenty or thirty years some of the new Belt and Road projects will likely stand as the highest example of what human ingenuity can achieve in its drive to master natural forces. A bridge crossing the Caspian Sea may make road transport between Europe and China fast and easy, changing old mental maps separating continents. The Kra Isthmus Canal in Thailand will do the same for the Indian and Pacific Oceans. But infrastructure is ultimately a means. The geographic space being transformed must be connected before it can start to grow areas of economic activity; industrial parks along infrastructure routes are slowly integrated to establish regional value chains and eventually support China’s rise to a technological superpower, leading the transformations of the future. Artificial intelligence, robotics, genetic engineering and space exploration. As it expands, the Belt and Road is bound to become increasingly futuristic. Self-driving vehicles on land, sea and air and trillions of connected devices worldwide will be empowered by a Belt, Road and Space fleet of China-centered satellites. Chinese companies are already planning to engage in deep-space economic activity, like building orbit solar power plants, and mining asteroids and the moon. One or more Sputnik moments - when Chinese technology leaps far ahead of what the West can do - will offer the final and most meaningful metric of success for the Belt and Road. The Belt and Road will never become universal—just as the West never became universal—but in some areas of the world it will rule unimpeded and different shades of influence will be felt everywhere. The problem is to determine the core of the new Chinese world picture and identify the main traits which it will come to impress upon the whole. Many of those traits are already visible in what is but the construction stage of the Belt and Road. Virtues are regularly invoked. Countries have relations of dependence, generosity, gratitude, respect and retribution. Relations between countries are much more diverse and complex than in the more formal Western-led order. Ritual is important, and so is history. Nations are better seen as intersecting stories and power the ability to determine where the story goes next. Even in its formative stage the Belt and Road is an exercise in the opacity of power. There is an exoteric doctrine of the initiative and then an esoteric practice where deals are agreed upon, often with no written evidence, and where hierarchy resembles that of security-clearance levels of access. The Belt and Road is like holy writ—never revealed completely and all at once, but only bit by bit and over many decades. Rapid change, old-fashioned morality, and secret communication. This will be a world of soothsayers, saints, and spooks. The Belt and Road may well never realize its goals. It may be abandoned as it runs into problems and the goals it sets out to achieve recede further into the distance. But success and failure are to be measured in terms of these goals, so we must start from them. The new world the initiative will try to create is not one where one piece on the chessboard will be replaced, not even one where the pieces will have been reorganized. It will be a world built anew by very different people and according to very different ideas.